Woo hoo! Splash away all! This widdle piddy cleaned her tail feathers! Wishing health and happiness for Pete & Repeat a.k.a. "Happy Feet"
No Plucked Duck is happy to offer handmade, one-of-a-kind feather hair "fascinators," made from the naturally molted feathers of rescued ducks that reside at sanctuaries. 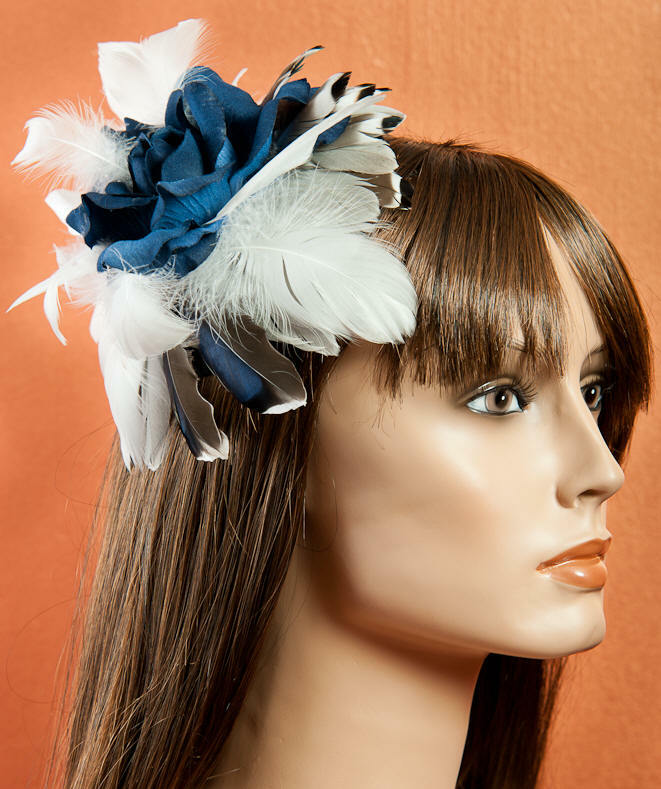 Jocamo has donated his own naturally molted feathers to help create this one-of-a-kind hair fascinator. 10% of all sales are donated to Majestic Waterfowl Sanctuary! Shop at: No Plucked Duck! The Lucy Goose is a proud member of Etsy for Animals. For genuine cruelty-free feather accessories. The Lucy Goose provides 100% cruelty-free feather earrings and accessories to conscientious individuals who wish to make ethically sound buying decisions. Shop at: The Lucy Goose! A few of you have emailed us upon discovering some of our super-secret, hidden diary pages right here on our website. We've been working on them for years, and a handful of you have been enjoying them for just as long. We haven't quite known what to do with them, so perhaps it's time we stop guarding this little treasure and just show you where they're tucked away! We hope you enjoy them and they give you a better insight to our behind-the-scenes joys and challenges. Layer a Poly-Vinyl Coated, tight-weave wire mesh over the bottom three feet of your existing perimeter fence. This will deter larger snakes from just slinking on in whenever they want. This can be easily done with the use of heavy-duty zip-ties. Install a solar-powered electric fence to improve the safety and effectiveness of your waterfowl enclosure. Attach the wire insulators/clips to your perimeter fencing a foot or two off of the ground and then string the electric wire through them. This will prevent snakes from climbing up the fencing. Be sure to mount "Electric Fence" warning signs, so they aren't a hazard for people. Chickens will often eat small snakes that can fit through wire mesh fencing, making them a great addition to your flock. Road Runners are also known to eat snakes. If you have wild populations in your area, encourage them to forage around your pens by keeping pet dogs and cats at bay during active hours. Have any other helpful tips for keeping snakes away? Please let us know what works for you by Contacting Us. We began noticing a thinning in the feathers around Duran Moon's eyes in June. When we noticed the condition worsening, we brought him in to see our vet. We began to treat the issue with some Vetropolycin antibiotic eye ointment twice daily for five days. Not only was there zero improvement, but his lower eyelids began drooping slightly.In addition, a small line of feathers around his bill also began disappearing, revealing the bare skin underneath. At this point, our vet gave Moon an injection of Ivermectin as a precautionary treatment against mites, which are sometimes known to gather around the eyes and edges of the bill in order to drink fluids. Although we couldn't see any mites, we opted to rule them out. Our vet also had us switch Moon from the Vetropolycin eye ointment to a non-antibiotic moistening vet ointment (Puralube�), thinking lubrication might be a big part of the issue. While there was less drooping of his lower eyelids over the course of the following week, Moon's condition did not improve and we began to notice some swelling around his right eye, so we brought him back to our vet for another follow up visit. Our vet could feel some heat in the area in addition to the swelling, so we opted for an x-ray to make sure nothing dangerous was going on inside. Fortunately, the x-ray was clear. Our vet prescribed a once daily, 75 mg dose of Clindamycin (antibiotic) in addition to a 12 mg dose of Rimadyl to address any swelling and discomfort in his eyes. He advised us to continue with the Puralube� ointment twice daily to help with eye lubrication. While on medications like Clindamycin it is important to include a probiotic power like Avi-Culture in your pet's treatment regime. We sprinkled Moon's over his food. Avi-Culture is safe for all flock members, so we had no worries about food-sharing. Within a few days we began to notice that his lower eyelids were no longer drooping at all, so the following week (during his check-up) our vet decided to swap out the Rimadyl with an anti-inflammatory eye drop instead. Now that we knew the anti-inflammatory medication was working it made more sense to administer it directly to his eyes rather giving him a pill that had effects on his entire system. In light of this, he prescribed Flurbiprofen .03% Ophthalmic Solution, which we picked up at our local human pharmacy in a 2.5 ml bottle. We administered one drop per eye, twice daily for 7 days (it's important that birds do not remain on this drop for long periods of time because it can have negative side effects). We did not administer the Puralube� ointment into his eyes during this 7-day treatment period. While we noticed a marked improvement in the feathers around his bill and and in his overall eye condition, his feathers around his eyes still had not come back, so we opted to do both fungal and bacterial cultures in both eyes. If there was an infection going on, we wanted to avoid any further progression that might lead to permanent eye damage--including blindness. Our vet swabbed both eyes for each test and sent them off to a lab. A little over a week later, the tests revealed that no infection was present. At this point our vet strongly believed it was an eye lubrication issue. Since Moon already has access to a nice-sized, stream-fed pond, which allows him to completely submerge himself if he wants to, we were encouraged to provide him with well water for a change. We placed a kiddy pool into our goose enclosure as well as adding four water buckets--after all, what's more fun for a gander than sticking his head down into a water bucket! We changed out these well water sources 2-3 times daily to ensure their cleanliness. Fortunately, Moon was a good boy and opted to swim and freshen up in these added water sources in lieu of his stream-fed pond. Within a week we began to see feather growth and by the end of two weeks all of his feathers had come back. We waited a few more weeks before slowly removing all but one bucket of well water from his pen. We watched him closely to make sure that reverting to the stream water was not adversely affecting him, and indeed it wasn't! Moon gets back to enjoying his pond water again! Once Moon was in the clear with no signs of relapse, we took a few moments to consider what had taken place. In light of his tests and treatment, we're pretty sure that the heat of summer led to a serious dry-eye condition. As a result a small infection brewed. A round of antibiotics and anti-inflammatory medication helped clean up the infection while also providing him comfort. After this, well water and eye lubricating ointment helped alleviate his dry eyes. Rule out that other birds are doing the plucking or that the bird is self-plucking or scratching at his own skin--both of which can cause feather loss. Vetropolycin antibiotic ointment often addresses the most common eye infections. An injection of Ivermectin eliminates the possibility of mites. Rimadyl and Flurbiprofen .03% Ophthalmic Solution reduce inflammation and provide comfort. Avi-Culture probiotic powder protects the intestinal flora. An x-ray rules out the possibility of a hidden injury or tumor. Swab both eyes and culture for bacterial and fungal infections. Puralube� (non-antibiotic eye lubrication ointment) lubricates the eyes. Multiple sources of well water (in lieu of pond or stream water) that are refreshed frequently throughout the day help moisten the skin, eyes and bill. Blood work may be in order if none of these steps result in improvement. Thank you Tom & Deb and Deb for donating funds to build our two new goose barns! And thank you Garey family and long-term sponsor Mary for making it possible for us to reface our existing two barns! Each barn has a slide-in-place door with a vent that opens and closes to adjust air flow, which we will feature in one of our upcoming newsletters. AND... special thanks to Dad for putting in so much time and effort designing and building these beautiful and cozy barns that will keep our rescues warm this winter! One of our New Goose Barns! 100% of all proceeds go to Majestic Waterfowl Sanctuary! 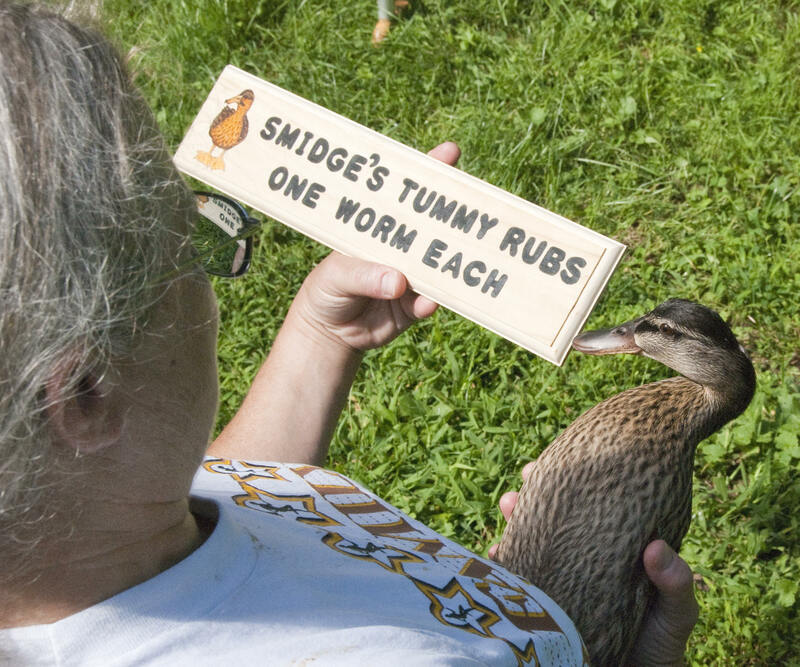 Click Here to view our duck signs. If you see one you like, contact us for custom lettering! OR... 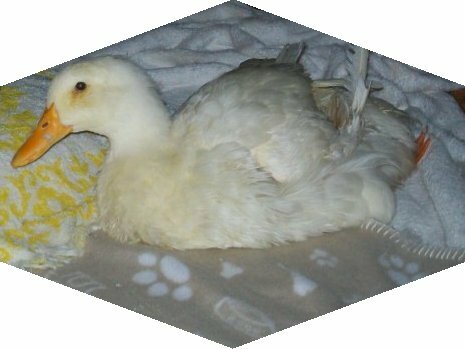 If you would like a custom painting of your duck or goose on a sign, we will need an emailed photograph for reference. All custom orders must be prepaid in full. Please click Here for complete details. *Sorry, this size/style font is no longer available!